The Great Barrier Reef is the world's largest living organism. An expanse of coral the size of Italy, home to an extraordinary array of sealife living in an interconnected ecosystem of brilliant colour and bewildering complexity. The reef can literally be seen from space as it stretches along the Queensland coastline for 2, 300 kms. Despite its gargantuan size, the Reef is extremely fragile. The survival of its precious ecosystem is under sustained threat from a variety of sources. Increased industrialisation within the World Heritage Area is suffocating the Reef, exacerbating the effects of climate change, and diminishing the Reef's resilience to natural threats such as cyclones. The Reef has lost half of its hard coral cover in the last thirty years. GetUp members have played a vital role in fighting back against some of these threats to our Reef - helping to preserve this national treasure for future generations. Read on to find out more about the Reef, what GetUp members have already achieved, and what we can do to protect the Reef now and in the future. What can I do right now to save the Reef? Coal mining giant Adani wants to expand their operations at Abbot Point within the Great Barrier Reef Marine Park. This project will lead to massive dredging and increased shipping in the Reef, resulting in millions of tonnes of coal being shipped to India and burned in coal-fired power plants, contributing to climate change. Adani need about $10 billion in funding to go ahead, and many huge foreign investment banks have already pledged not to support the project, including Deutsche Bank, Royal Bank of Scotland, HSBC, Barclays and Citibank. So far the big 4 Australian banks have not, and they will be crucial in stopping Adani. Commonwealth, NAB, Westpac and ANZ are all that stands between Adani and our reef. GetUp members have been running a concerted campaign to show them they have our full support in opposing Adani, and saving our reef. You can help our banks to save the Reef by e-mailing your bank directly to express your concerns, or by adding your name to the petition at the top right of this page. Adani is struggling to find private investors to fund its coal projects in Queensland's Galilee Basin. The price of coal is falling and public sentiment is firmly against it because of the damage it will do to the environment, especially the Great Barrier Reef. Now Queensland Premier Campbell Newman has expressed his intent to sell off public assets in order to help fund Abbot Point. This is outrageous - Newman actually wants to use taxpayer money that could be spent on health, education and public infrastructure to provide corporate welfare to a mining billionaire. Currently we're working with top scriptwriters and political strategists to put together an ad campaign that will be aired in key marginal electorates in the lead-up to the upcoming Queensland elections. Can you chip in to help get this ad seen by as many voters as possible? Right now, our Federal Environment Minister Greg Hunt is making decisions that will have a critical impact on the future of the Great Barrier Reef. Write him an e-mail now and ask for his commitment to protect the Reef. What have GetUp members achieved already? Our year kicked off with a bang when Queensland Premier Campbell Newman called a snap election for January 31. This was a Premier who not only supported Adani's plans at Abbot Point, he wanted to fund them. The Newman Government had said they were prepared to use hundreds of millions of taxpayer dollars to fund Abbot Point, even when other private investors refused to do so because the project was too risky. That's taxpayer money that would otherwise be spent on vital infrastructure such as schools and hospitals, being offered as corporate welfare to a mining billionaire. We worked with top political strategists to create a series of hard-hitting TV ads that informed people about the LNP's terrible track record on protecting the Reef. GetUp members provided the funds to get these ads shown in prime-time spots in key marginal electorates around Queensland. We printed 150,000 'How-to-Vote' cards that showed people how they could use their vote to save the Reef. And on election day 600 GetUp volunteers handed them out at polling stations all over Queensland. Our 'How-to-vote' cards spooked the LNP so much that they made a desperate last-minute attempt to silence us - actually taking out a supreme court injunction against us on election day! A few hours later the judge threw the injunction out of court, saying that 'there was no real question to be tried'. Ultimately Campbell Newman and the LNP lost the election, with polling showing that saving the Reef was a major vote-changing issue. 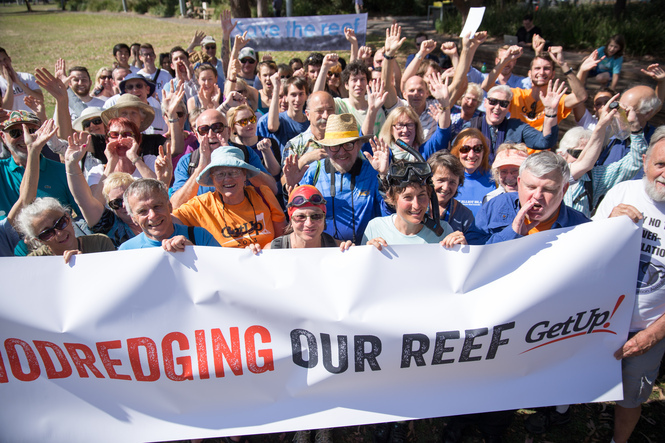 Thanks to the incredible effort of GetUp members, we secured a big win for the Reef. GetUp members successfully stalled dredging plans on the Reef when they delivered a petition with 72,524 member signatures to the Great Barrier Reef Marine Park Authority's head office in Townsville. GetUp members supported a legal challenge to the federal Government's plans to allow dumping and dredging in the Great Barrier Reef Marine Park. $300, 000 of donations from GetUp members allowed our allies at the Mackay Conservation Group (MCG) and the Environmental Defencer's Office (EDO) to fight the case. They argued that under the federal Environment Protection and Biodiversity Conservation Act the government was required to fully protect world heritage-listed areas, and they were neglecting those duties by allowing offshore dredging. This enormous grassroots support was noticed by the media, and the Government, who backflipped on offshore dredging. We had something of a Pyrrhic victory with the legal case. The Government ruled out offshore dredging, only to approve of dumping in the Caley Valley wetlands in October. This was devastating news, as the wetlands are an integral part of the Reef ecosystem - they act as a breeding ground for turtles and fish, and filter sediment entering Reef waters. The Environment Minister Greg Hunt tried to pass the approval very quickly and very quietly, without a full Environmental Impact Statement. We released this Facebook post on the same day he made the decision. It was shared by over 20, 000 people and seen by 2 million. 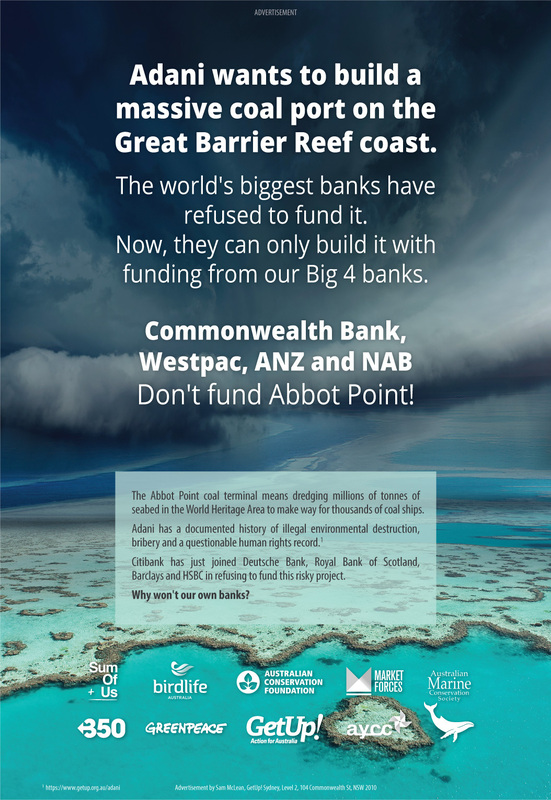 When Deutsche Bank appeared likely to fund Abbot Point, around 4, 000 GetUp members raised nearly $140, 000 dollars in less than 24 hours to run this ad in the Financial Times across Europe. The ad sparked international media coverage, including a major feature in Germany's leading newspaper. The publication of the ad coincided with Deutsche Bank's AGM. Our friends at the German organisation Campact helped us ramp up the pressure on Deutsche Bank at a time when they knew all eyes were on them. Campact repurposed some of our campaign materials, and got thousands of Deutsche Bank customers to join GetUp members in flooding Deutsche Bank's Facebook, Twitter and e-mail accounts with messages urging them not to fund Abbot Point. The public outcry got the message through - the head of Deutsche Bank's Supervisory Board declared, "We are currently not involved with this project and will also not be involved with it in the future." We were able to put Adani's terrible track record on environmental protection, human rights, and ethical business practice in the public spotlight with this crowd-funded video. Someone was obviously embarrassed by it, as the video was later pulled from YouTube under highly suspicious circumstances. Someone had set up a fake website, uploaded our video, and claimed our video as their own. However, that cynical attempt to silence our criticism backfired in quite a major way. Outraged GetUp members promptly provided $130, 000 to support an online search program and integrated ad buy that would mean that anytime someone searched for 'Adani' online the first thing they would see would be our video. The video was shared by more than 18, 000 people on Facebook and has now had over 250, 000 views on YouTube. GetUp has consistently raised awareness about the role of banks in funding Adani. So far we've seen Deutsche Bank, HSBC, Bank of Scotland and Citibank publicly rule out funding destructive projects on the Reef. Over 100 GetUp members came out to protest at the IUCN Parks Congress, where Environment Minister Greg Hunt was one of the keynote speakers. We wanted to let the congregation of international politicians, scientists and environmentalists know what a poor job the Australian Government was doing in protecting the Reef. Since then Minister Hunt has announced a ban on dumping dredge spoil in the Marine Park, and the ALP have announced their opposition to dumping in the World Heritage Area. Both are promising steps in the right direction, but still nowhere near good enough. GetUp partnered with TropFest and UpWorthy to launch a short film competition about the Great Barrier Reef called #ReefReels. We got over 70 incredible entries, five of which were screened at Tropfest. Over 50 GetUp members and staff braved some fairly apocalyptic weather to help out at Tropfest. They collected 800 new signatures for our Save the Reef petition, handed out Reef tattoos and sold 1000 seats with GetUp's Reef campaign advertised on them. Thanks to the incredible effort of our filmmakers and volunteers, #ReefReels brought our campaign to a whole new audience. Click here to see some of the best entries. This year our members have also been prolifically e-mailing politicians, banks and power brokers to show their support for the Reef. Over 7, 000 GetUp members have e-mailed their banks directly to warn them that they don't want their money being used to fund environmentally destructive projects. 15, 000 people e-mailed the Environment Minister Greg Hunt urging him not to entrust the Carmichael mine site to Adani. And over 14, 000 people e-mailed the Great Barrier Reef Marine Park Authority urging them not to allow dredging in the Marine Park. GetUp members joined with Greenpeace, the Australian Youth Climate Coalition, Australian Marine Conservation Society, Friends of the Earth and beyond Beyond Zero Emissions at six strategic locations around the country to halt coal export expansion. At the same time, GetUp delivered an enormous petition of over 127,000 signatures to Federal Environment Minister Tony Burke with one resonant message: Australians expect more from the Government when it comes to protecting our Reef. GetUp members kept up the heat in the face of a pending approval a new mega-mine, two times larger than the biggest coal mine in Australia, so huge it would swallow up 47,000 hectares of land – including a 10,000 hectare nature refuge and endangered species habitat. Almost 15,000 GetUp members wrote submissions to the Federal Government clearly articulating their concerns about the mine and supporting their claims with relevant scientific research. This response was so huge it made national media and news of the massive opposition to this project was picked up by mining industry websites around the world. Mining powerhouse Glencore-Xstrata held its Annual General Meeting in Switzerland, a meeting that was to seal the fate of a coal port proposal in one of the most wonderful parts of the Great Barrier Reef. But they hadn't counted on Ginny Gerlach, a GetUp member from Central Queensland and a leader in the community campaign, showing up. Ginny purchased Glencore-Xstrata shares, enough to get her inside the meeting, where she respectfully represented all of us who want to save the Reef. Her trip was made possible by the generosity of regular GetUp donors who chip in a small amount every week to fund this type of strategic action. UNESCO officials took the extraordinary step of coming to Australia to investigate how Australian governments have allowed one of our most precious World Heritage areas to come under threat. UNESCO was to meet with scientists, environment groups, state and local government, representatives from the fishing and tourism industry and mining companies. But one group was missing: the Australian public. To ensure UNESCO took the community's views into account, almost 10,000 GetUp members made personal submissions to the UNESCO delegation to Australia, greatly impressing upon them just how important the Reef is to Australians everywhere. GetUp members then hit the streets at a public rally in Cairns to personally deliver these messages to the UNESCO World Heritage Committee mission team. 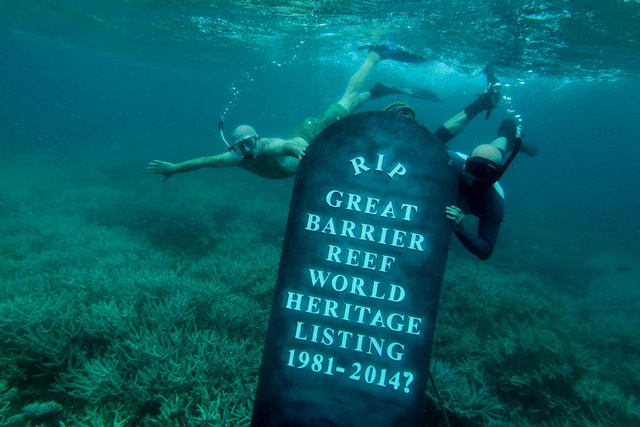 This strong visible display of community concern helped UNESCO see beyond doubt that many Australians felt that the Reef should be listed as 'under threat'. This move would greatly embarrass the Federal Government, draw welcome media attention to the destruction of the Reef and strengthen our case for the Government stop dredging and industrial developments around the Reef until a strategic plan is put in place for its protection. Campaigning by GetUp and fellow environment groups paid off when a UNESCO report confirmed that the Great Barrier Reef Heritage Area was indeed threatened by the proposed massive expansion of mining in Far North Queensland. UNESCO's concerns were consistent with a new nationwide opinion poll commissioned by GetUp which found that 79% of Australians were concerned about the expansion of mining along the coast of the Great Barrier Reef Heritage Area. On June 30, the World Heritage Committee – comprising 21 countries from around the world who oversee World Heritage sites – met to make a decision. GetUp, in partnership with Greenpeace, engaged World Heritage expert Alec Marr to travel to St Petersburg where he lobbied delegates on our behalf at the annual World Heritage Committee meeting. 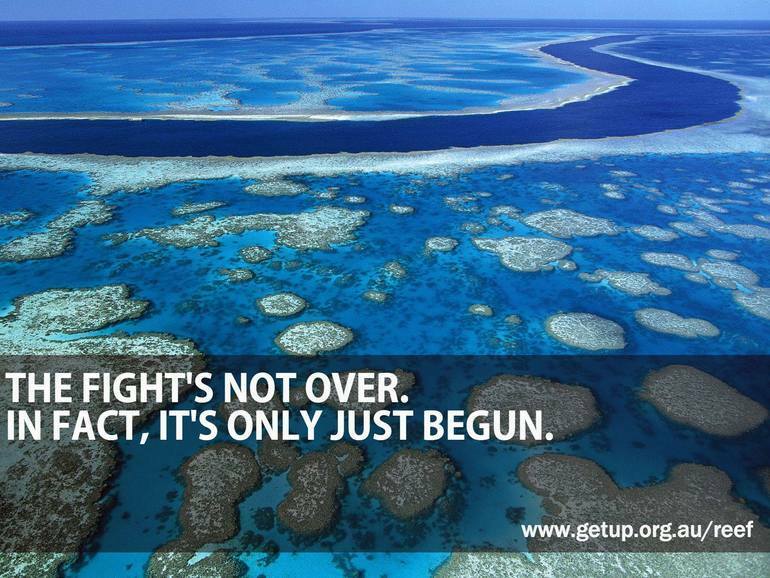 By this time, GetUp's 'Save the Reef' campaign had swelled to 101,935 Australians. At this meeting, the Committee passed recommendations calling on the Australian Government to take urgent action to save the Great Barrier Reef. UNESCO set Australia a deadline: 1 February, 2013 – by which time the Australian Government has to provide evidence that they have made progress in protecting the Reef. If they fail to do so, Australia's most iconic natural area and a major economic driver of the tourism industry will officially be listed as "in danger". GetUp obtained controversial footage from Northern Queensland showing damage being done to the Great Barrier Reef World Heritage Area. We used it for a powerful new ad, which combined the footage with interviews with prominent scientists. GetUp members donated to place the ad in cinemas right across Queensland, as well as in Environment Minister Tony Burke's electorate. One month later, recognising the importance of Australia's Federal environmental powers for protecting the Reef, thousands of members chipped in yet again to run an ad to pressure politicians attending the Council of Australian Governments not to hand over protection of our environment to the States. This ad ran in The Australian on the very day that the Council met. 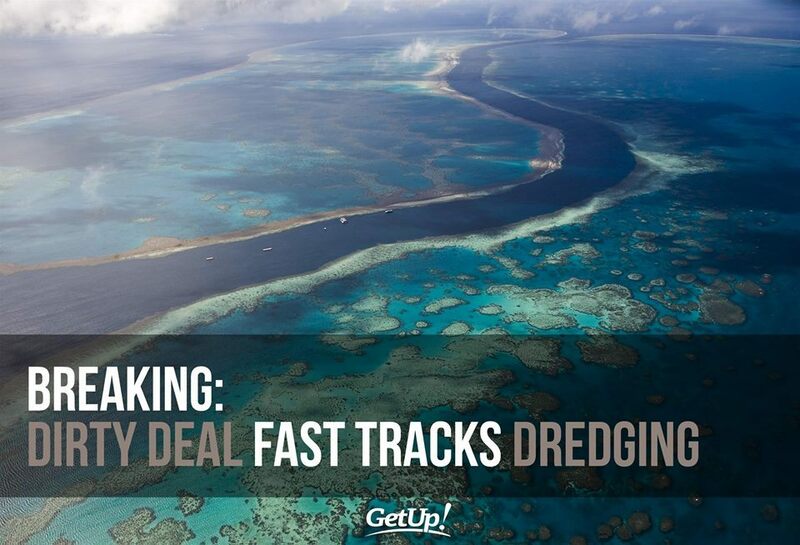 GetUp's Reef campaign began in November when we learned that millions of cubic metres of sea floor were to be dredged in the Reef World Heritage area to make way for coal seam gas export facilities. 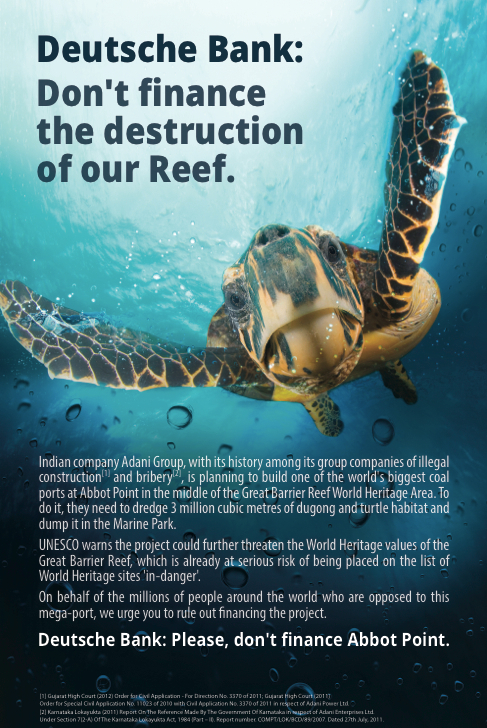 After UNESCO warned that these activities could lead to the Reef losing its world heritage status, GetUp members came to the rescue - organising an emergency petition asking the government to halt dredging in the World Heritage Area until UNESCO completed their assessment of the area. GetUp member, Lincoln, got in touch offering to help deliver the then 74,800-strong petition to the UNESCO offices in Paris. With a large poster pegged to his bike, Lincoln met with Guy Debonnet, Chief of the Special Projects Unit, and Feng Jing, Chief of the Asia and Pacific Section, presenting them with a visual representation of the petition signatures, as well as a letter explaining the campaign. Adani - who are they and why must they be stopped? Adani are an Indian energy giant with plans to expand the already massive coal terminal at Abbott Point, which could result in as much as 5 million tonnes of dredge spoil being dumped on the reef, and thousands more coal ships going through. Adani also have a track record in regards to environmental protection and human rights that is so woeful it indicates they shouldn't be trusted with a backyard swimming pool, let alone the Great Barrier Reef. In 2001 Adani opened a similar coal port on a mangrove forest in Mundra India. Just as they are promising to protect the reef now, they promised to protect the mangrove then. But instead they destroyed 75 hectares of mangrove in a conservation area by dumping dredge on them. By 2012 Adani had been accused of so many environmental breaches and illegal activities at their Mundra operation that the Government created a special committee to investigate them. The litany of offences the committee revealed is mind-boggling. They were accused of stealing iron ore by overloading their own trucks, and bribing everyone from port officials to customs to politicians in order to keep them quiet. Adani demonstrated a blatant disregard for local communities by building air-strips without permission, and building water intakes on other people's land. Is this really a company we trust to take care of one of the world's greatest natural wonders? Dredging refers to the act of scooping up large quantities of seabed in order to make way for ports and other projects, or to widen shipping lanes. Sediment is created during the dredging process, and when the spoils are later dumped somewhere else. The sediment muddies the water, blocking sunlight from reaching the coral and seagrass below, thereby stunting their development. As the coral and seagrass provide shelter and food for the fish, turtles and dugongs that call the Reef home, dredging can have very serious consequences for the overall health of the Reef. Researchers at James Cook University found that the larval development of clownfish was severely stunted by increased sediment in the water, doubling the time it took them to reach juvenile status. 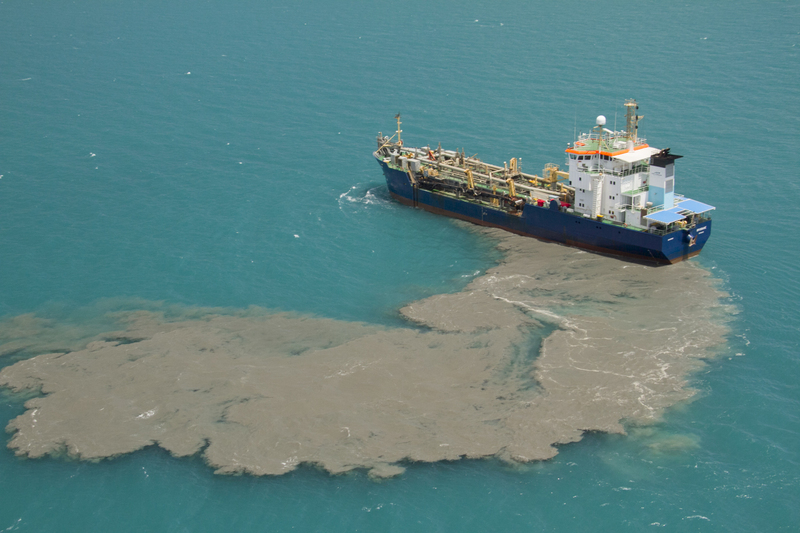 According to calculations by Jon Brodie, Senior Principal research Officer at James Cook University, 140 million tonnes of marine sediment could be dumped on the reef if all the port development plans planned for the next decade were to go ahead. Climate change represents the greatest existential threat to the reef. Warm waters kill coral. And the shallow waters of the Great Barrier Reef heat up particularly quickly, as they reside on a broad continental shelf that denies them access to deeper cool waters. Tim Flannery has described the effect as being like 'a shallow saucer of water left in the sun'. When carbon dioxide is absorbed in the water it creates carbonic acid, leading to ocean acidification. Increased acidity dissolves the calcium carbonate necessary to form coral, and destroys the symbiotic relationship between algae and coral that produces the brilliant colours of the reef. When coral and algae no longer support each other the coral turns a ghostly white colour. This is refered to as bleaching. Coral-loss has severe flow-on effects for the rest of the reef ecosystem as coral provides shelter for young fish. Alarmingly, the oceans are now acidifying at the fastest rate in 30 million years. According to the International Programme on the State of the Ocean (IPSO), urgent and drastic cuts to our fossil fuel consumption are necessary if we are to avoid a mass extinction event in our oceans. All the proposed mining operations along the shoreline and in the Galilee Basin will intensify a vicious circle of destruction. First, the removal of the coal will require massive amount of dredging and dumping, and increased shipping through the reef. Then, the final product will be shipped to India, and burned in coal-fired factories, releasing massive amounts of carbon dioxide into the atmosphere, which will eventually return to the Reef, rapidly warming its waters as it's reabsorbed. That's why the health of the Reef (and the planet in general) depends on that coal staying in the ground. Your friends would probably like to check this out, why don't you share it with them?